(AP) -- A gecko with leopard-like spots on its body and a fanged frog that eats birds are among 163 new species discovered last year in the Mekong River region of Southeast Asia, an environmental group said Friday. 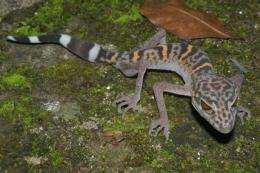 That gecko species was not included in the WWF report because it hasn't been published in a peer-reviewed journal yet. All the other species listed by the WWF have been described in journals. Simon Mahood, a conservation adviser for BirdLife International in Indochina, welcomed WWF's attention to the new species and said more could be discovered if additional money is put into conservation and countries make it easier to do field work.